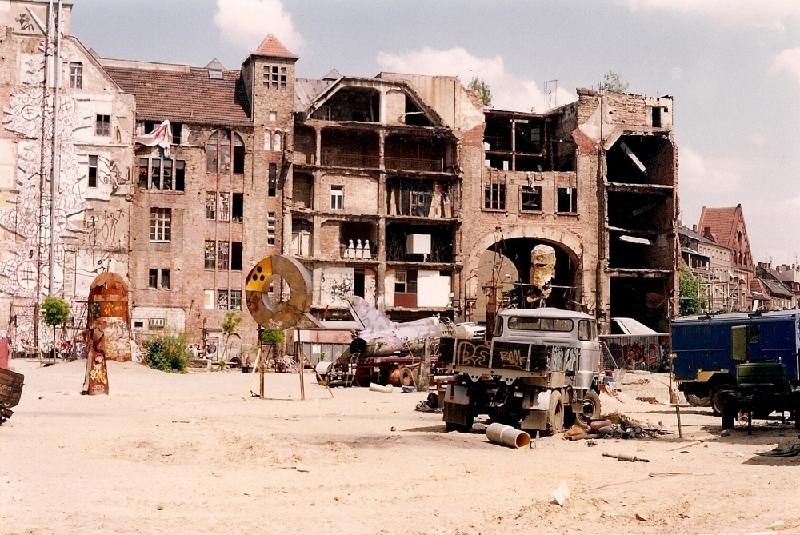 In his 2010 interview with the Tacheles resident Martin Reiter, historian Rory MacLean describes Tacheles Art House in the following way: Tacheles is part war ruin, part artists’ colony, part anarchic wonderland, and wholly Berlin… But its future is under threat. Today we are living in that future where threats came true, and Kunsthaus Tacheles shared the fate of many historical and cultural venues that became victims of gentrification and merciless capitalism. The closure of Kunsthaus Tacheles in 2012 is often described as an end of an era, a demise of a two-decade-long tradition of free-spirited artistic expression, which best captured those feelings of newly found freedom in post-Wall Berlin. Situated in a massive building in Mitte district, Kunsthaus Tacheles best embodies the euphoria of country’s reunification and artistic boom that came after the fall of the Wall. As one of Berlin’s most famous independent art centers and one of the most remarkable artistic initiatives, it was a venue of interest for all art enthusiasts, regardless of their preferences. 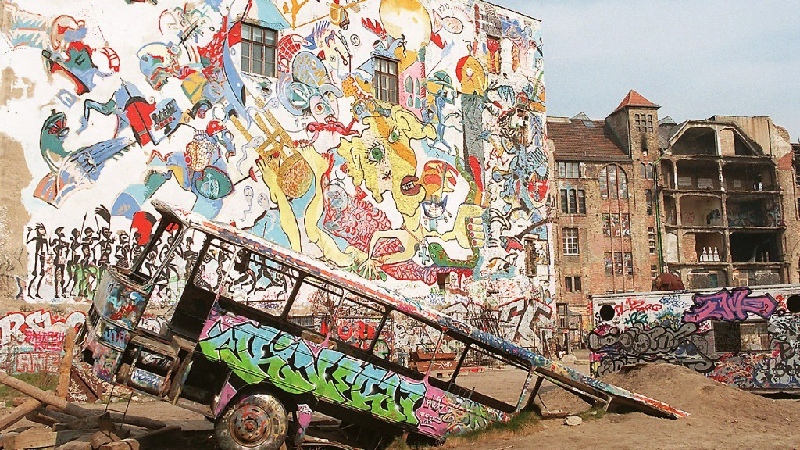 Although the building is evicted and the center is closed for a few years now, the legacy of Kunsthaus Tacheles and its artists shouldn’t be forgotten. 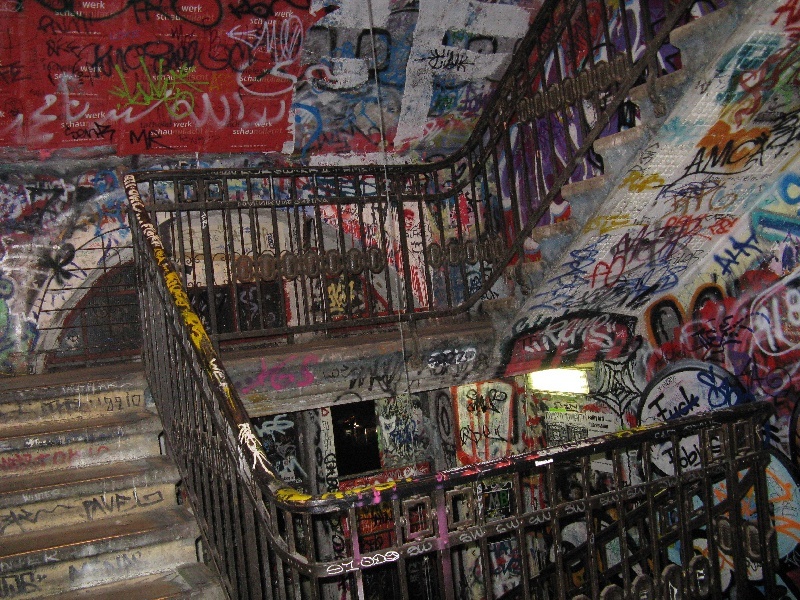 In the following paragraphs, we are taking a brief look into the story of Tacheles Art House, Berlin’s iconic art squat that greatly influenced the perception of Berlin as one of the leading alternative art venues. The five-story building on Oranienburger Strasse, later known as Kunsthaus Tacheles has a rich and colorful history, spanning more than a century. Constructed between 1907 and 1908 the Friedrichstraßenpassage building hosted a shopping complex which was among the first and the largest of its kind in Berlin. In 1928, the building fell into the hands of AEG (German electric company), serving as a showroom for their products and new technological developments. Then called “The House of Technology,” the building hosted one of the first German television transmissions. From the early 1930’s the building was increasingly used by the Nazi party members and later on, it became the central office of the SS. During the years of World War II, Friedrichstraßenpassage building on Oranienburger Street suffered severe damage due to bomb raids and most of the building infrastructure was destroyed, never to be fully restored again. In the years after the war, there were several plans for the complete destruction of the building, and two months prior to the final planned demolition in 1990; a thing happened that would change the history of the building forever. Three months after the fall of the Berlin Wall, a group of creative individuals going by the name Künstlerinitiative Tacheles (Artists’ Initiative Tacheles) marched into the damaged five-story building, turning it into a vibrant and thriving hub of alternative culture. By adopting the Yiddish word Tacheles for their name, a word which when translated signifies “honest”, “straightforward talk”, this group of individuals challenged the notion of limited artistic freedom inherent to the context of former East Germany. People coming from both sides of once divided city occupied the ruined building, proving that it was structurally sound and saving it through countless negotiations with the building management in Berlin-Mitte. Eventually, their efforts resulted in the recognition of the building as a historic landmark. Serving as a squat to many international and local names, activists, and subversives, Kunsthaus Tacheles became synonymous with uninhibited and experimental production, as well as alternative lifestyles formed around the notion of newly reclaimed social freedom. The Guardian’s Jonatan Jones compares the atmosphere of Tacheles to the legendary avant-garde venues like Cabaret Voltaire, calling it the vast vision of anarchist Dada descent, and describing perfectly the experimental, rebellious and chaotic spirit of Berlin’s most famous art squat. From monumental mural paintings on the building’s exterior walls, to the impressive steel sculpture garden in the yard, staircases and hallways filled with graffiti writings, posters and stickers, art flourished in all corners of the occupied building. And let’s not forget the breathtaking, cutting-edge happenings, performances, and exhibitions hosted inside of the building walls. The house Tacheles welcomed artists of various backgrounds and nationalities, regardless of their working mediums and styles. In the first years, the art center was run by the curator and cultural entrepreneur Jochen Sandig, and in those early days the center hosted trailblazing events, featuring artists such as Mark Divo, musicians Spiral Tribe, theatre group DNTT, performance artist Lennie Lee, dancer and choreographer Sasha Waltz, the RA.M.M. Theater and sculptors of the Mutoid Waste Company. In its golden days, Kunsthaus Tacheles was a home to up to sixty artists from around the world, who were working in thirty artist studios. Except for providing housing and workspace for its resident artists, building on Oranienburger Strasse also grew into a true art center with its own independent cinema, café, performance and exhibition space and numerous workshops. One of the most notable features of this venue is certainly its one-of-a-kind, open-air sculpture garden, comprised of numerous metal structures and sculptural works made of debris, urban detritus, vehicles and found objects. 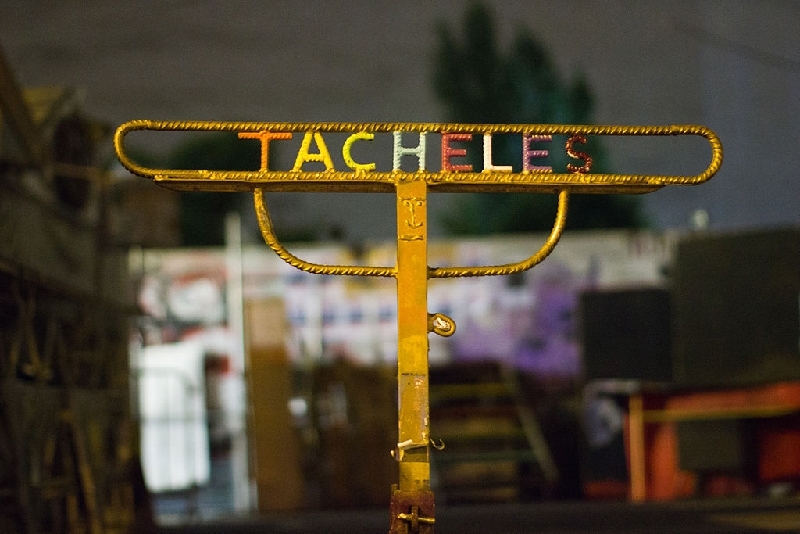 For 22 years, Tacheles was a home to radical creatives who weren’t willing to compromise, independent artists, outsiders to the institutionalized art scene and citizens who stood up for their ideals. In the minds of many Berliners, Kunsthaus Tacheles stood for zeitgeist of post-Wall Berlin, a symbol of creative and independent thought and artistic expression. From its department store beginnings to Nazi and SS headquarters to free-for-all land of creativity, the building on Oranienburger Strasse is representative of major historic transformations the city went through over the years, until finally becoming a casualty of gentrification in 2012. The struggles to preserve the creative space of Kunsthaus Tacheles have been an ongoing effort since the mid-nineties. In 1995, the city sold the building to the reel estate Fundus Group, who gave the artists a 10-year lease in 1998. By the time the lease expired the Fundus Group went insolvent and the building fell into the hands of HSH Nordbank, eager to evict the residents and sell the property. Numerous protests with the bank officials and petitions didn’t help, however, and the last crowd of Tacheles creatives was evicted on September 4th, 2012. The closure of Kunsthaus Tacheles, Berlin’s landmark for independent art and culture, brought that sour feeling that the city is no longer a bohemian hub for alternative culture and lifestyles.